15+ miles on a charge and a top speed of 5 mph. Choice of three seat widths – 16”, 18” and 20”. Handles inclines and functions very well on all surfaces, even grass and sand. Weighs 146 lbs. and can’t be disassembled. The joystick must be located on the right armrest making it impossible for a left-hander to use. Reliable, sturdy and comfortable, moves smoothly over different surfaces and comes at a reasonable price. For me the most important quality of a wheelchair is the level of mobility it affords. My condition makes it impossible for me to walk and yet I still treasure self-reliance. I am sure most of us really don’t want to be dependent on others for day-to-day chores and random activities. Wheelchairs were developed to allow us to live fuller lives. So now we have folding power wheelchairs that are truly travel-friendly. And with the Drive Medical Cirrus Plus Folding Power Wheelchair I can take off on almost hassle-free adventures. 1. The design and weight of the Drive Medical Cirrus Plus Folding Power Wheelchair makes this freedom possible. Rear wheel drive on 12.5” foam filled flat-free tires ensures a comfortable ride over long distances. The chair handles inclines and functions very well on all surfaces, even grass and sand. 2. The Drive Medical Cirrus Plus comes with two 12V 36Ah (U1) batteries that can be conveniently charged through a port on the underside of the controller. 3. 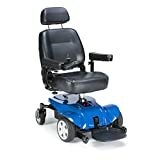 You can get 15+ miles on a charge and a top speed of 5 mph – quite good for this category of wheelchair. 4. The seat is very comfortable with a padded upholstery back that can be adjusted for tension. And the heavily padded armrests can be adjusted or removed according to the user’s needs. The footrests, with heel loops, can be swung out of the way for easy access. 5. The weight capacity is an adequate 300 lbs. 6. The chair is available with a choice of three seat widths – 16”, 18” and 20”. Measure the width of the hips when sitting down and add one inch to allow for easy access getting in and out of the chair. 7. Because I count on getting in and out of tight spaces, I appreciate the turning radius of 30”-33”, (depending on the seat width) and a ground clearance of 4”, both of which allow for easy maneuverability. 8. 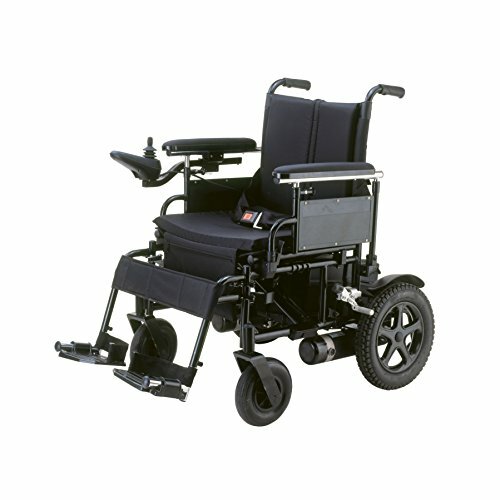 The Drive Medical Cirrus Plus comes with a seat belt, a foam seat cushion, manual wheel locks, anti-tip wheels and a pouch for convenient storage of valuables as standard. A lifetime limited warranty on the frame is included as well as a fourteen-month limited warranty on the motor/electronics and a six-month limited warranty on the batteries. Yet, what I don’t understand, and what worries me most about this wheelchair is that it is marketed as a foldable, easy to transport chair. Yes, while it is foldable it weighs 146 lbs. and can’t be disassembled. I have to say this leaves me scratching my head. You’d need a super-strong helper or two people to get this chair into the trunk of a car, and even then it would have to be a fairly spacious trunk. While the length of the joystick mount can be adjusted it must be located on the right armrest of the wheelchair. If easy transportation isn’t necessary for you then the Drive Medical Cirrus Plus Folding Power Wheelchair, which is reliable, sturdy and comfortable, moves smoothly over different surfaces and comes at a reasonable price might be worth a second look.